In The Scent of Living Wills, Mitchel Tumuhimbise introduces the reader to a United Nations of renegade teens in whose hands the fate of the world seems to depend. Speculative to the core, The Scent of Living Wills makes use of a percussive language and the great pull of love to vocalize what might be a necessary reaffirmation of African ingenuity. Black Letter Media: “The Scent of Living Wills” has a precise bite to it. Can we talk about how vital it is that speculative fiction begins to embody in the text’s title the very subversive spin it puts on western expectations about Africa? Mitchel Tumuhimbise: True, it’s quite a subversive spin, though in the narrator’s perspective, what the West expects from Africa is not a thing to weigh—since the title’s subsequent text embodies a speculation of subversives, affecting the whole of humanity such that people of every part of the world share the load of salvaging the human race, with its virtues and values, from extinction. Obviously, it’s quite interesting how Africa in this story defies the western world’s expectations—and it’s a thing worth drawing attention to given that Africa has always been a situational-underdog yet, this time around, the story does not take that into account. This all is to say, we are looking up to Africa which doesn’t look to the west (or east) for solutions for its own challenges. The solutions, in the protagonist’s view, can be found in the young generations since they are, and will continue to be, the most affected. We are looking at a people who nurture their young generations to put up with such subversives which I think is crucial even in the real world. BLM: I like that we’re giving less priority to what the west thinks of and how it sees Africa – I’m wondering if this might signal a new wave of work in turning inwards, being critically self-reflective, even a move away from a kind of speaking from a diasporic position to, and not with, Africa? MT: Personally, I’d suppose an inward turn would be more effective than speaking, or making, interventions from a diasporic position. This has nothing to say that Africa should disregard the diasporic interventions—if they ideally resonate with the native African’s interests, then they are worthwhile—yet we shouldn’t rely entirely on them. I wish to point out the fact that there’s, in existence, a kind of native Africans, in all facets of African communities, who have the challenges of Africa at heart, have a genuine disposition and are making efforts to seeing solutions through; those are the better, to be relied on, they’re the best positioned for the in-ward turn and since they possess the aforementioned self-reflectiveness. BLM: If we agree that here you’re speculating on a future world order, can I also suggest that you’re speaking back against the biopiracy of the world when it comes to African inventions – your narrator and his cohorts basically have to abandon earth with the “other secret” soon as it’s discovered? MT: Virtually, but not initially intended. The world has been through an evolution of exploitative means; slavery, colonialism as the previous forms of biopiracy. However, Africa and its young people—unstintingly rich in flair—can still be a different refinery and not base so much on what exploitation the rest of the world has done in the past. There’s a void, so big, to be filled in terms of a creating a positive disposition to change this by taking advantage of the potential of Africa’s young generations. This, I believe, can heal the harm done by the biopiracy—and we are beginning to see that it can be fixed through shredding off this victim-mentality shroud and being more action-oriented. BLM: I detect in you a desire to espouse some fresh notions of African worth – does moralism or the pitfalls of rhetoric worry you much when you’re writing? MT: Yes, in the sense that I’m afraid of writing which is merely a set of philosophical and unrealistic principles. Every objective writer, I imagine, has a way to ensure they make an intersection of concept and reality while they try to exploit the best and most honest of intentions lest it turns into rhetorical writing. I, personally, believe in a specific set of morals, but I have a conviction that the best moral obligation everyone has is to be empirical and action-oriented. BLM: There’s a seamless manner in which you traverse certain histories (of the Atlantic slave trade, Nazi historiography, HIV/Aids) in “The Scent of Living Wills” – it’s not a question of “Okay, now we know what to call the UFOs”, but you resuscitate Hitler and Stalin and Mengele to question, I imagine, the very values we put on official records? Who says they are dead, you seem to be saying, when the world is as preoccupied with war and destruction as it was before all the world wars? MT: Yes, literally. Hitler, Stalin and Mengele were diabolic but their demise doesn’t presuppose that the world now has more just and effective government systems! There are many points of controversy which even span beyond—purely politics and societal-dissent—to topics of disease and bioethics. The bottom-line is that if we can’t point out what is of real benefit to the very people who are directly affected by these afflictions, we will hardly get any closer to a workable and fair resolution of these controversies. There’s a great need to put aside what’s politically correct and focus on what solution is relevant to the people’s challenges. BLM: And we need new ways of speaking about the “political situation” in Africa, right? Without debasing literature to the level of news commentary? MT: Literature preceded, and has acted as a back-up for, news commentary. The leverage literature has is that it’s less censored and can easily bold out quite several an honest perspective without the fear of appearing popularly right. But since literature, in itself, isn’t infallible and absolute, other and new upcoming ways are key for openly speaking about the political situation. Webinars, internet forums and online discussions—back-channel-chat-like, I think such diversity is crucial. MT: Well, that symbolism was intentional, I can say. The paradox of our history is that man is fundamentally free yet freedom—ironically—isn’t free! The biggest barrier to true freedom, I suppose, are the fetters in people’s mindsets. In the story, the narrator doesn’t fall for physical fetters being the most diabolic form of thraldom, but rather, his perspective of looking at someone’s egoistic notions above the common good as well as capitalizing on a particular situation’s challenges, to feign giving a solution in people’s interests, as the fountain of the worst forms of “slavery” we see today. I admit, I aimed at pointing out a personal saying, “take away a man’s pain and you’ll exchange it for his freedom.” I believe slavery of mindsets is the root for every injustice we face today in addition to relativism, and populism—all used for a brand of pseudo-utilitarianism. Take for instance, terrorism, and conflict incited by diversity in religious beliefs, and what has come to be referred to as “African-democracy”—where a brand of African leaders capitalizes on their popularity to impose their own perspective of democracy which, of course, serves them and their personal gains well. BLM: The necessity to decolonise the mind, as Ngũgĩ wa Thiong’o has pointed out – but I always wonder, how do we divorce that from the broader decolonial project? Merely writing in our indigenous languages when the politics we carry in the text are still compromised by anti-black undertones is still problematic. MT: The politics comes in when the African tries to fit content-authentic with the rest of the world which puts us at, sort of, an inferior stand. We should be openly proud of our identity and heritage, which is so rich, but without trying to appear chauvinistic. With time, we expect a change in tones, a diversification which can still air a scent of Africa. Take for instance, there’s rich literature in many of our indigenous languages already, and it can be transliterated to other languages so as to paint it clearly against the diversity of literature in the rest of the world. I can write African without necessarily writing in my native language. It’s a matter of feeling a positive pride in who we are and what we stand for—the right mindset. And this also applies to the way the black African community can handle its challenges without diffidence. BLM: “The Scent of Living Wills” hints at multiple stories of love – romantic, parental, even an intimacy with the enemy-aliens that approaches something close to love. And yet, does the narrator reverse or revolt, when it comes to Triffany? MT: We can’t be certain of what the narrator will do—noting that he is quite ambitious though with a great deal of sentimentality when it comes to Triffany. This makes him not so predictable as he’s an innovative and thoughtful mind who could be, already, having questions like: ‘What if the aliens can love? What if aliens can bond with humanity in a manner akin to Triffany’s? What if we have aliens who are fundamentally human-like but from a different system of biospheres? What if we both share beliefs and virtues as invaluable as freedoms, rights and a similar sense of faith and religion? Isn’t that what the universe really deserves? Isn’t that what we’re here for?’ Thus, Triffany or any other alien with human values, in his perspective, shouldn’t be pinned as from an enemy-entity. He would likely look for a sort of middle ground and, then naturally, we’d expect him to reverse so as to fit the new impossible-possibility of a unity of entities that initially seemed far from the love and unity amongst one another. But, that remains a mystery to us—his secret. Mitchel Tumuhimbise is from Kampala, Uganda, and is currently studying cytotechnology at Makerere University Medical School. Also a poet, he is deeply affected by the beauty of imagination and is drawn toward integration of art, science and technology into African literature. 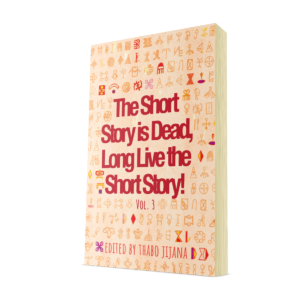 Copies of “The Short Story is Dead, Long Live the Short Story!” can be ordered directly from Black Letter Media and on Amazon, African Flavour Books and your nearest good bookstore; we recently announced the winners for the third volume – read all about it here.